I have just finished a rainforest tour today. I guided 4 visitors from the USA, and Hongkong. We went to Tambrauw regency where we stayed for 4 days and 3 nights trekking and camping on the sides of Syuan river. We went there by a 4WD car and stayed in outdoor environment using tents as our "hotel." We enjoyed birdwatching, and swimming. We had plenty of time swimming in the river whose water is cool and fresh. There were fish, and shrimp in the river. The indigenous people used traditional fishing tools to catch them. The Papuan people were expert in hunting. One of our workers was able to catch a bandicoot just like a cat punches on a mouse. Bandicoot, cuscus possum, deer, wild pig, and snake were the source of protein of the indigenous people who live in Tambrauw mountains. In the mornings, when the weather was bright, a lot of butterflies flew in the air to find flowers that were blooming from numerous trees around us. There were some whose sizes were larger than the average butterfly. They were called birdwing butterflies. While we were walking along the trails of the riverside, we saw cockatoo, kingfisher, egret, blyth's hornbill and many other birds which we could not identify. Under the trees, the temperature was cool. We hired local villagers to cook our food and carry our bags and other logistical goods. 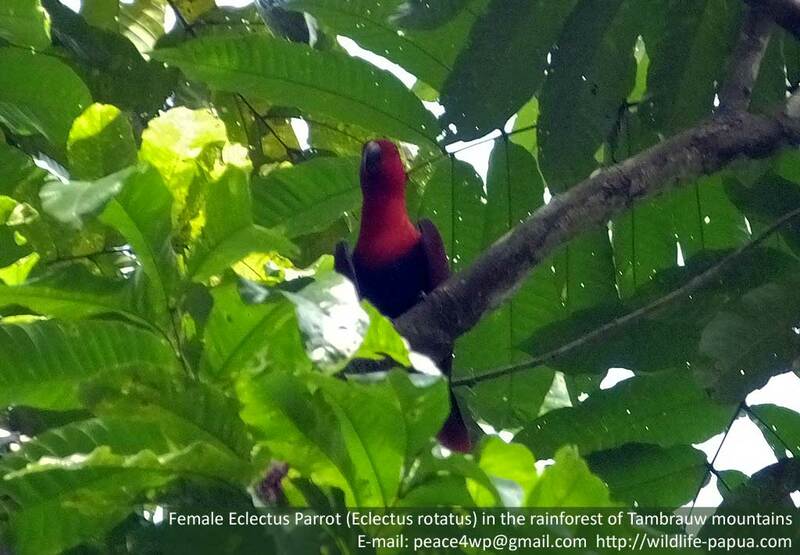 My concept in ecotourism was preserving the rainforest environment by empowering local villagers. When the indigenous people got economic benefits from eco-tourism, they would seriously support the preservation of the forest and protect the wildlife. Because most of the visitors were from the United States, I extended the trip to Werur village where they were able to see Amsterdam island and Middlelburg island. These two islands, with Werur (or Mar) and Sausapor, became the base for US forces when they were fighting Japanese forces during World War II. I introduced eco-tourism in this regency this year. 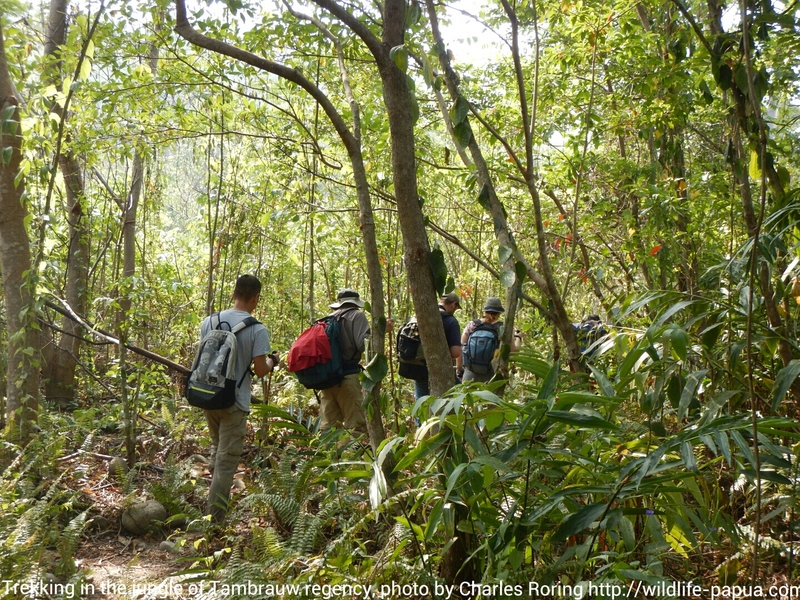 Some foreign tourists have visited Tambrauw regency to explore the beauty of its forest. The temperature in the forest is cool with abundant water. Visitors can enjoy swimming or just reading their favorite books at the bank of the river while listening to the music of nature (sounds of bids, the swaying of tree branches blown by the wind and water flowing in the river). 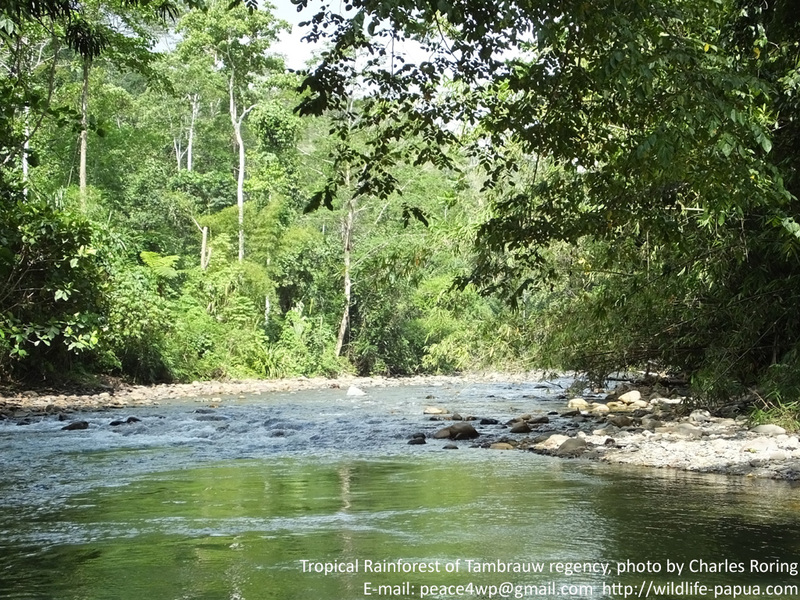 The tropical rainforest along the sides of Syuan river is the natural habitat of various species of wild animals wild pig; deer; wallaby; bandicoot; and a lot of species of birds including cassowary bird, lesser birds of paradise, eclectus parrot, goliath cockatoo, sulphur crested cockatoo, grey crow (Corvus tristis), Papuan frogmouth, egrets, egrets, blyth's hornbill, brahminy kite. I also used to see a Ribbon-tailed Astrapia (Astrapia mayeri) flying over my head when I was swimming in Syuan river. I was a very rare sighting. 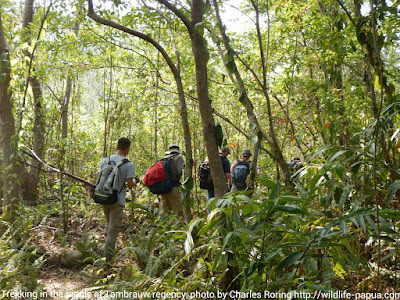 The mountain range of Tambrauw is the natural habitat of a lot of species of animals and plants. Last month, I guided a tourist from Luxembourg on a 5-day/ 4-night trekking, camping and birding tour in the jungle of Cuan river. We saw sulphur crested cockatoo, friar bird, cuscus possum, birdwing butterflies, deers, wild pigs, cassowary birds, and colorful beetles. 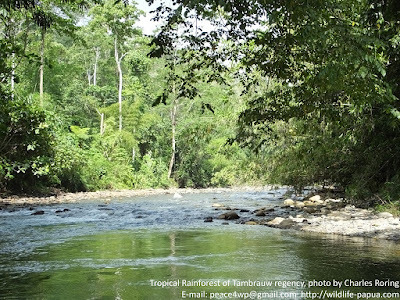 The easiest way to explore the jungle was by walking along the sides of the river. We built tents at the bank of Cuan river, and enjoyed the beauty of the surrounding nature. At night the sounds of insect were mixed with the sound of flowing water in the river. It was so natural and refreshing. The next morning we dismantled our tents and walked up against the stream. Sometimes we had to cross the river to make shortcuts. Some people from the nearby Jokte village helped us. There were two women who cooked for us and some men who carried our bags and caught shrimps in the rivers for our lunch and dinner. During the days, we walked in the jungle exploring the plants and the animals. I saw several species of colorful butterflies that were flying from one wild flower to another to collect nectar. I also saw a small beetle that looked like a plastic toy. When I checked on the internet for its name, I found out that its name was Eupholus schoenherri. After the fourth day of our rainforest tour, we walked out of the jungle and continued our trip to Sausapor town. In the afternoon, we went to the beach and enjoyed snorkeling over the coral reef. Sausapor was aJ small village in 1944 when American forces landed on its beach to fight the Imperial Japanese Forces during World War II. Now the sea in Sausapor is relatively calm for the coral reef to thrive again. The northern coast of West Papua has got plenty of surf spots too. Visitors who are interested in this sports should visit Sausapor in the months of October, November, January, February, and March.